Are You Watching the Yen? It's pretty apparent now that the shenanigans from the Federal Reserve has given investors a very "investable" environment. But what about the Bank of Japan? They have been doing their own version of QE-- and a pretty aggressive one at that. Their program led to a strong devaluation of the Yen throughout 2013, which helped spur equity markets higher. In fact, I'll argue that the liquidity provided by the BoJ was a key driver to the "non-stop" upside for equities last year. But now, the yen appears to be topping out. There was a momentum divergence and a failure to resume its trend. If you invest in stocks, this is important. Yen strength tends to not be good for stocks. 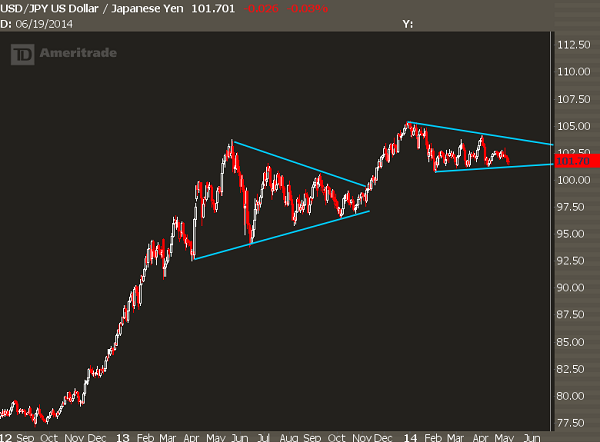 If the USD/JPY fails to stay above 101, the equity markets will have a hard time re-asserting the cyclical bull market.